Custom Name plates - Created Same Day for Next Day or overnight shipping! Custom Name Plates Engraved NOW! See it as you make it, order it, and receive NEXT DAY. Identify employee desks, front counters reception areas with custom office signs, engraved nameplates, solid wood desk signs and desktop name plates. Sign solutions ideal for front counter or lobby areas, employee & cubicle identification, waiting rooms, doctors offices and more. Design your nameplate your way! Professional office desk signs & desk name plates for demanding professionals. Create your plate for speedy 24 hour service, choose overnight shipping for Next Day. Create & proof your 2 x 8 Custom Nameplate. Create & Proof your 2 x 10 Custom Nameplate. Create & Proof your 2 x 10 nameplate with wood wedge desk holder. 2 x 8 Nameplate Desk Holder for Engraved Nameplates. Choose from Black, Silver, or Gold. 2 x 10 Nameplate Desk Holder for Engraved Signs. Choose from Black, Silver, or Gold. 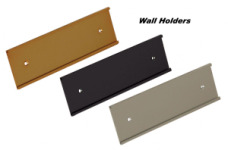 2 x 8 Wall Nameplate Holder can be applied with 3M heavy duty tape or has holes for screws. 2 x 10 Wall Nameplate Holder for Engraved Signs. Choose from Black, Silver, or Gold.